Hair loss or baldness (Androgonetic Alopecia – AGA) is a topic that concerns both men and women. No one has remained indifferent to a brush full of hair or the fact that every time you run your hand through your hair it falls out. It is important to understand the structure of the hair. The hair is a long, spongy tube coated with tiled-like cells with no nerves or blood vessels. The hair follicle has the shape of a bulb, and into it enters a structure called papilla – this is a connective tissue that is rich in blood vessels, which supply oxygen and nutrients to the hair and are important in the development of the hypothesis itself. Destruction of this tissue will destroy the hair itself. The cells that make up the hair follicle are matrix cells, with cells closest to the hair being stem cells. Normally, hair is in growth processes for about 4 years, and then it falls out. When normal hair turnover occurs, 50 to 100 hairs fall daily, and instead, new, thick hair (final hair) grows. But in the process of baldness, the new hairs that grow instead of those that have fallen are thin and soft. Normally, about 85% of the hairs are in the growth stage, and about 10% to 15% at the hair loss stage. In the case of baldness, the percentage of hairs in the hair loss phase increases, and can reach up to 50%. The principle underlying PRP/Platelet Rich Plasma treatment is to restore or regenerate the root and hair follicle to size and structure as prior to its shrinkage, with increasing blood supply to the hair follicle. How Does It Work and How It Is Done? The growth factors in PRP are able to activate cells, such as fibroblasts, to produce new collagen and stimulate stem cella. Approximately 10 ml of venous blood are pumped from the patient into a vacuum tube containing a gel and anticoagulants, and placed in a centrifuge. The centrifuge separates the red blood cells from plasma and platelets. Platelets located at the bottom of the plasma phase are plasma-laced and are 8 to 2 times more concentrated. 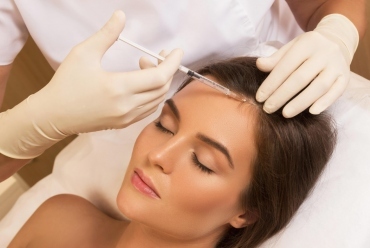 The platelet-rich plasma is injected using a standard mesotherapy technique (multiple injections superficially into the upper dermis. The treatment takes only 1 hour and is safe, effective, non-invasive, and virtually pain-free. Three to six treatments at 1-month intervals are typically required to obtain optimal results which include thicker, higher quality hair growth. Hair restoration treatments are suitable for men and women of all ages who suffer from genetic baldness, hair loss and hair thinning. The concept of hair loss or ‘miniaturization’ occurs in the follicle when the hair falls out. Miniaturization refers to the gradual shrinking of the follicle and the thinning of the hair inside until the follicle disappears completely. Hormonal changes in women can have significant negative effects on hair loss. Medical conditions such as thyroid disease, autoimmune disease (alopecia areata) and also genetic predisposition to hair loss. 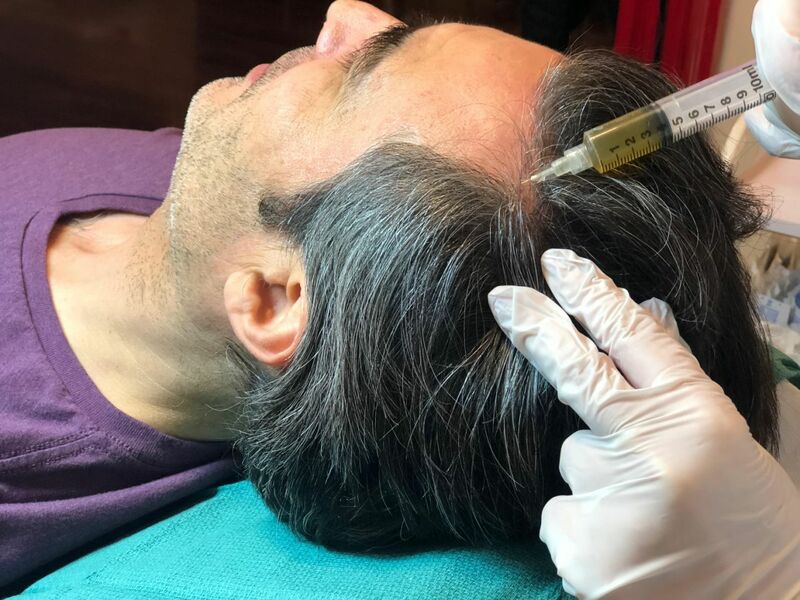 PRP/ Platelet Rich Plasma Treatment is proven in scientific publications to be effective and fight hair loss with excellent results! 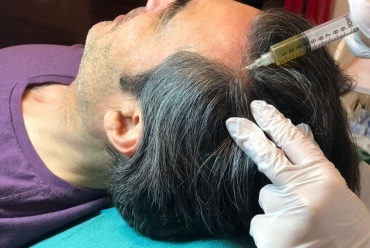 The principle underlying PRP/Platelet Rich Plasma treatment is to restore or regenerate the root of the hair follicle to size and structure as prior to its damage, with increasing blood supply to the hair follicle. How Many Treatments Of PRP Do I Need For Hair Loss? It is recommended to have 4 to 6 treatments one month apart per year & After 1 to 2 Maintenance treatments.